Here are the three 11″ x 17″ prints that I will be offering as part of the Kickstarter campaign. 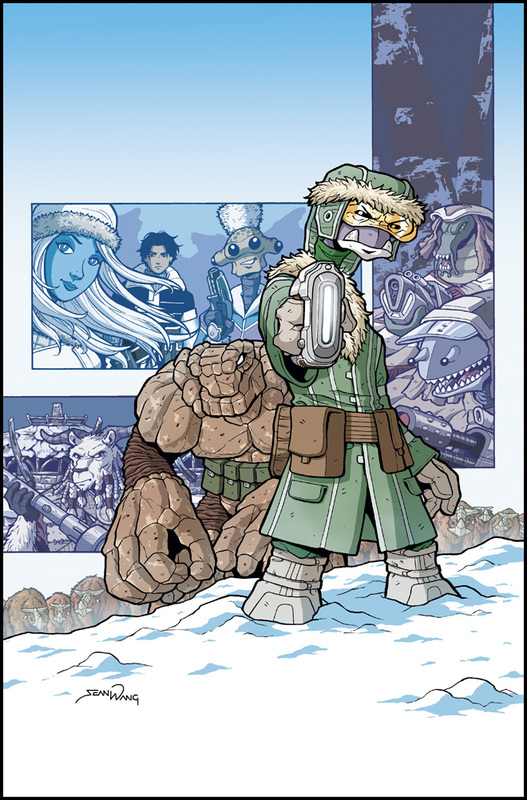 They are the images originally done for The Big Snow Job chapter cover #1, chapter cover #3, and the graphic novel front cover. 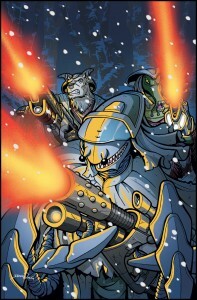 New Kickstarter Stretch Goal: Battle Royale Print! The Runners: The Big Snow Job Kickstarter project recently passed the $12,000 mark, officially DOUBLING the initial goal amount! Woo-hoo! That is very exciting! 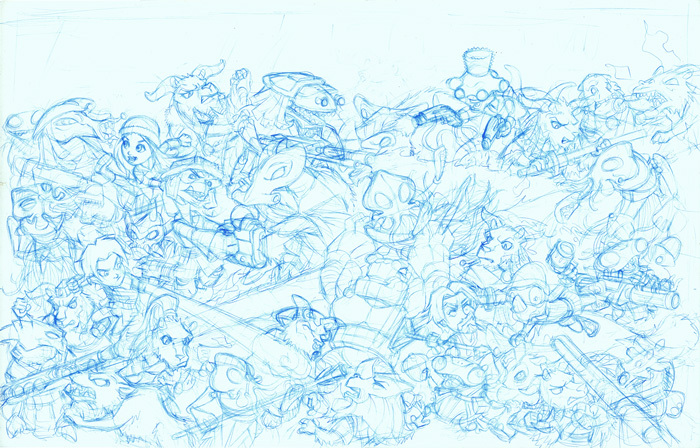 To commemorate the milestone, I am officially announcing the next Kickstarter Stretch Goal for $13,500, which will be a “Battle Royale” print!! 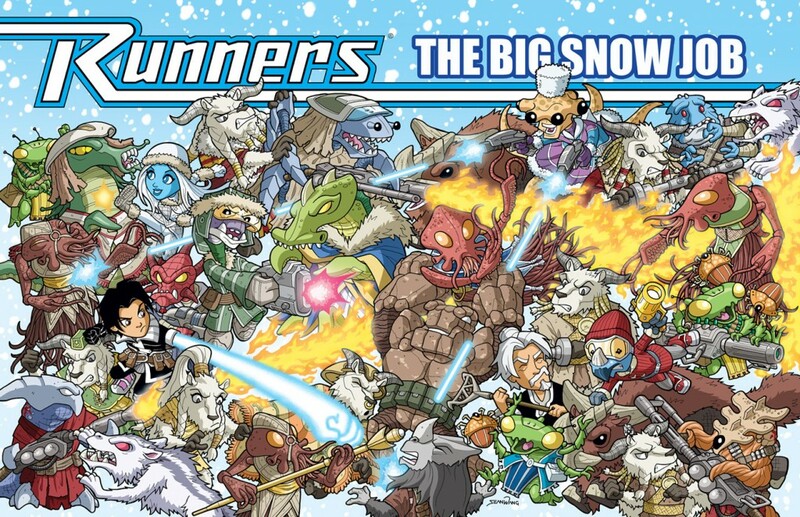 This is a really fun piece as it features ALL the major and minor characters from the story arc in cartoony style in one big slugfest. Here are the pencils. 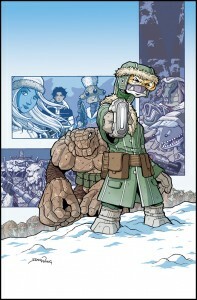 The final image will be 11″ x 17″ and fully inked and colored. 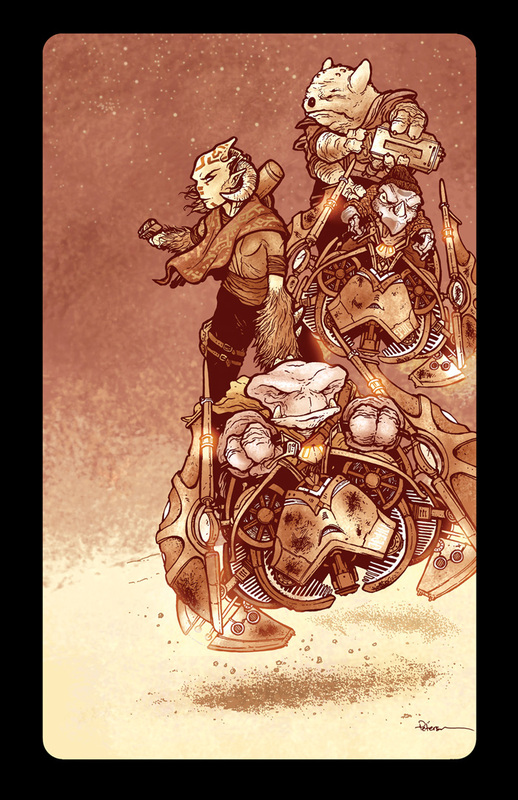 It will be issued as a PDF to ALL backers and as a physical print to everyone at the $35 reward level and higher. So please help me in continuing to spread the word about the project so that we can meet the next stretch goal, and check out the Kickstarter page shortly for more announcements, including additional stretch goals and some new reward tiers. Oh yeah, as a side note, before I launched the campaign, my wife and I had a little bet since we had absolutely no idea how the project would do. She bet it would end under $13,ooo, and if it did, I would give up condiments (mostly ketchup, which she hates) for a full month. I bet it would go over $13,000, in which case she would finally have to stop resisting and watch Star Trek II: The Wrath of Khan. I am delighted to report that with the passing of the $13k benchmark, my wife will now see one of my top 10 movies. And Ricardo Montalban’s top two pecs. I am very excited to announce a new Reward tier for the Runners Kickstarter project that features the amazing artwork of good friend and Mouse Guard creator David Petersen. I’m a huge fan of his work and he is a fan of Runners as well, so a while back, we traded pinups. He did an awesome pinup of the flashback Runners crew from volume 1: Bad Goods. I never had the chance to include that with the first graphic novel, so I decided to include it in the printing of the new one. 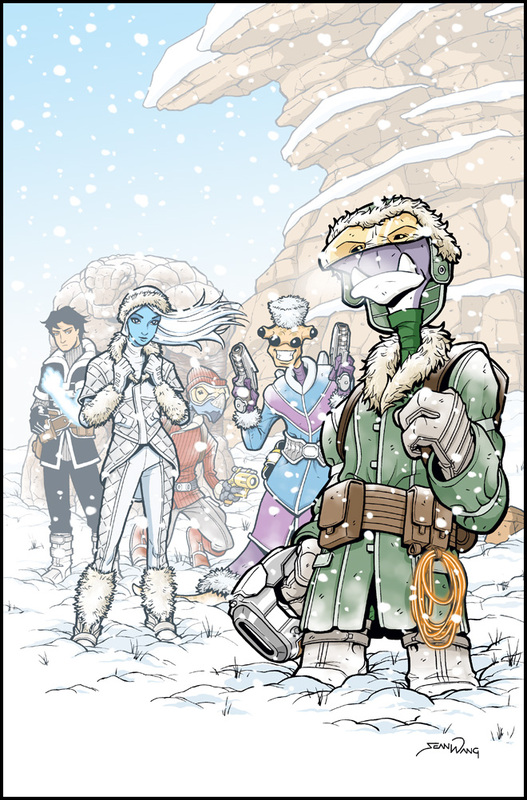 But since all the other pinups in the new book have a snow theme, David was generous enough to do a SECOND pinup, this time featuring the crew in snow gear! When I told David about my Kickstarter project, he very graciously suggested the option of including prints of his two pinups as reward items. 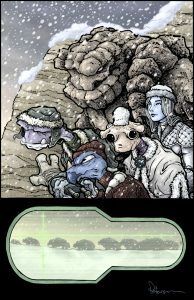 Personally, I love the idea of making these available to fans of David’s work, and he was excited about the idea of helping me with my campaign, so there is now a new $49 Reward, appropriately called the “Guard” level, that includes both of his pinups as 11″ x 17″ prints. 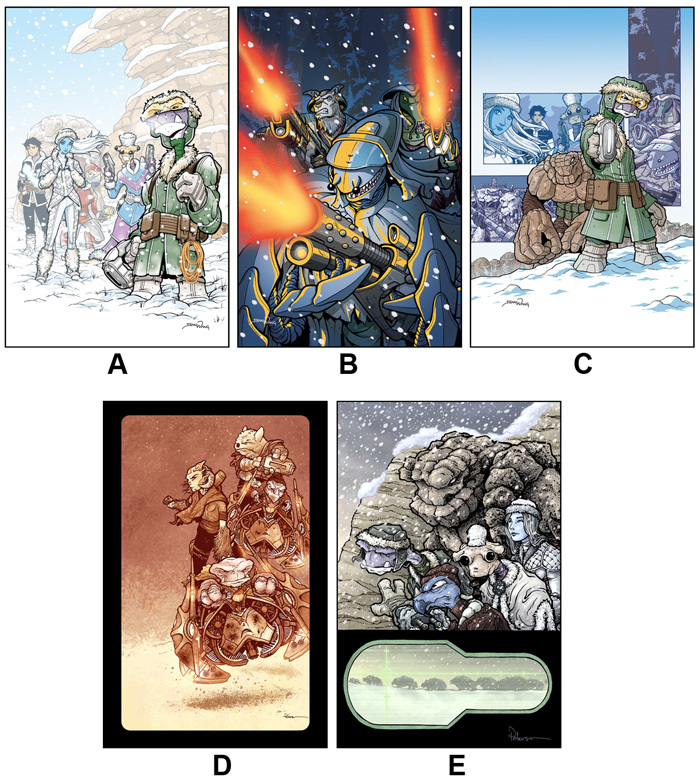 These prints are also available as add-ons for backers of other tiers who would like to include either (or both) of his prints with their current rewards. With the Kickstarter campaign now officially over, I am now in process of sending out Kickstarter surveys to gather information from backers. For those who have selected rewards with prints, please use the following guide to select which print(s) you would like. You will also be able to specify if you want any of prints A-C signed.